Muscle March (マッスル行進曲 Massuru Kōshinkyoku) is a quirky Japanese action game stuffed full of macho bodybuilders. The all mighty protein powder has been stolen so it’s up to Tony and his muscle-bound crew to catch the thieves. Choose from a variety of perfectly molded superstars and bring these terrible villains to justice. As each thief attempts their escape, they will smash through walls while making a variety of poses. You must match these poses to fit through the holes and catch up to the thieves. The protein powder will be yours again! Flex your muscles by yourself or with up to three friends in turn based macho excitement. Posing for a few minutes not enough? Enjoy Endless Rush mode until your muscles bulge and explode! 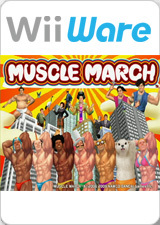 Muscle March will also be the first WiiWare title to offer a polar bear in tight swimwear! Endless Rush mode may freeze on the game rules screen when using JIT, or continue on to display garbage memory values onscreen with Interpreter. This was fixed by 5.0-2127. See issue 9782. The graph below charts the compatibility with Muscle March since Dolphin's 2.0 release, listing revisions only where a compatibility change occurred. This page was last edited on 1 August 2018, at 10:40.